1 INSERM UMRS1147, CNRS SNC 5014, Université Paris Descartes, Equipe labellisée Ligue Nationale contre le cancer 2016. Paris, France. Recently, Yong X. Chen et al. proposed an alternative method to prepare a suspended hydrogel membrane platform for cell culture, designing a complicated protocol to synthesize the GelMA and to fabricate an open-grid structure made of polylactic acid (PLA) polymer using a commercial printer.5 Our tip shows a novel low-cost method for preparing a cross-liked gelatin membrane as a permeable support useful for potential biological applications. In addition, the proposed protocol doesn’t require the use of sophisticated fabrication technologies or expensive materials. It uses gelatin from porcine skin and the formaldehyde vapor technique to cross-link the gelatin membrane. 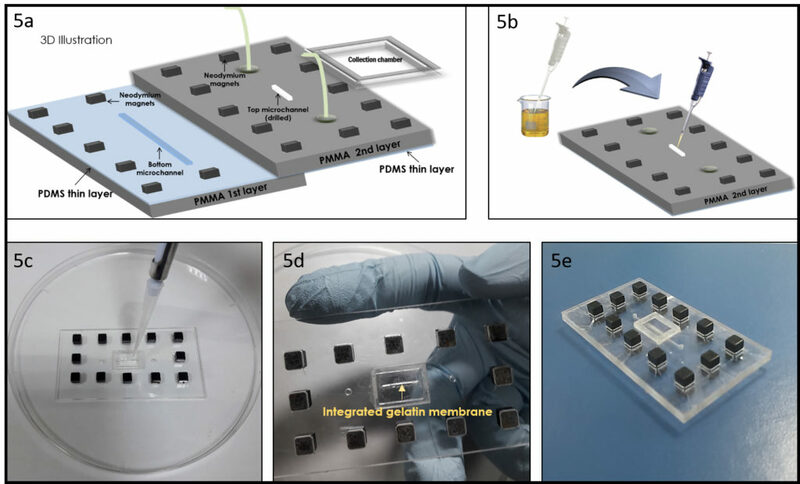 As proof of concept, we integrate the gelatin membrane into a microfluidic chip, to show the possibility to develop a platform for comparable studies in static and dynamic conditions. Furthermore, to demonstrate the resistance to culture temperature (around 37° C) of the prepared gelatin membrane, we tested the mechanical properties (Young’s modulus) before and after the incubation time (2 days). Finally, we observed the preservation of the mechanical properties and structural integrity that makes the membrane usable for studies with cell culture. Remove the porous membrane from the Transwell® insert (Fig. 1a-1c) or alternatively use a similar homemade support. To facilitate this step is convenient to use a scalpel to incise the membrane along the entire diameter. After the removal of the membrane, the Transwell® support is ready to use. Position the structure at the center of the PMMA chamber (depth 2 mm at least) (Fig 2a) and pour liquid 10% w/v gelatin, without bubbles, onto the PMMA chamber and inside the Transwell® support (Fig 2b). After 2 min of stabilization, put the system in the fridge, for at least 10 minutes. In this case, we used the vapor formaldehyde method to cross-link the prepared gelatin membrane and to obtain a system with lower aqueous solubility, higher mechanical strength and stability against enzymatic degradation. We exposed the gelatin membrane to formaldehyde vapors for 1 day. In Figure 4a we show the difference, after 48 h of culture conditions, between a sample cross-linked (left) and not (right). The final depth of the cross-linked gelatin membrane is around 1 mm, however, it is possible to change the depth tuning the liquid gelatin amount. Finally, we calculated, before and after the incubation time, the young’s modulus of the cross-linked gelatin membrane, observing a similar value of 40 kPa (compression test by using hydraulic testing system Instron DX). Integration of the gelatin membrane into a microchip. In this section, we detail the integration of the gelatin membrane into a microfluidic chip. As example, we used the same geometry proposed in our previous work4, to make a device for a permeability experiment (Figure 5a). As shown in Figure 5b, just pour the liquid gelatin into the smaller drilled microchannel, using a pipette to form a thin uniform layer of gelatin (Figure 5c). After gelation at 4° C, cross-link the formed gelatin membrane using the previously described method, the result is shown in Figure 5d. To bond the different PMMA-PDMS substrates we propose here a magnetic approach recently developed by our group10, to preserve the gelatin membrane by physical-chemical stress as in the case of solvent evaporation and plasma bonding. Figure 5e shows the final chip. Conclusions: In this tip, a novel biocompatible gelatin permeable support was obtained by using a simple and low cost fabrication method. Vapor formaldehyde method or other chemical crosslinking approach can be applied to crosslink the integrated gelatin membrane for the use as potential scaffolds for cell culture. Furthermore, the Young’s modulus and the thickness of the permeable membrane can be adjusted by changing the initial concentration of the gelatin, the degree of cross linking and the amount of liquid gelatin. Finally, we showed the integration of the gelatin membrane into a modular microchip. Therefore, we propose an easy and low cost method to prepare a permeable gelatin membrane for cell biology and for other applications. This work was carried out with the support of the Pierre-Gilles de Gennes Institute equipment (“Investissements d’Avenir” program, reference: ANR 10-NANO 0207). Geckil, Hikmet, et al. “Engineering hydrogels as extracellular matrix mimics.” Nanomedicine 5.3 (2010): 469-484. Guarnieri, Daniela, et al. “Shuttle‐Mediated Nanoparticle Delivery to the Blood–Brain Barrier.” Small 9.6 (2013): 853-862. Falanga, A. P., Pitingolo, G., Celentano, M., Cosentino, A., Melone, P., Vecchione, R. & Netti, P. A. (2016). Shuttle‐mediated nanoparticle transport across an in vitro brain endothelium under flow conditions. Biotechnology and Bioengineering. Chen, Yong X., et al. “A Novel Suspended Hydrogel Membrane Platform for Cell Culture.” Journal of Nanotechnology in Engineering and Medicine 6.2 (2015): 021002. Sisson, Kristin, et al. “Evaluation of cross-linking methods for electrospun gelatin on cell growth and viability.” Biomacromolecules 10.7 (2009): 1675-1680. Usta, M., et al. “Behavior and properties of neat and filled gelatins.” Biomaterials 24.1 (2003): 165-172. Talebian, A., et al. “The effect of glutaraldehyde on the properties of gelatin films.” Kemija u industriji 56.11 (2007): 537-541. Bigi, A., et al. “Stabilization of gelatin films by crosslinking with genipin.” Biomaterials 23.24 (2002): 4827-4832.